This microkakejiku is a beautiful piece by Ren Adams. The Usagi is a wise and kind animal in the tale Kachi Kachi Yama, where the rabbit gets revenge on the mean spirited Tanuki. These scrolls are order made first name translations. For inquiries on customizing your own scroll please contact sales@customjapanesecalligraphy.com or visit the webstore. This customer wanted to make scrolls describing the attributes of these three competitive swimmers. Derek is written on the far left scroll. His name is in Katakana which is the syllabic vocabulary for foreign words in Japanese. On the left column he was described as a humble, dedicated & obedient swimmer. Noelle is written on the middle scroll with the name Noelle in Katakana on the right column. The left column describes her as a quiet, loving & fast swimmer. Dylan is written on the far right scroll. The name in Katakana is written on the right with the left column describing him as a strong, funny & energetic swimmer. It took more time than normal to make sure these scrolls width and length were consistent, but it was a good exercise in discipline to make them. This order was difficult in the translation, but once we were able to get the customer what he wanted it was very satisfying. The following two scrolls were made on commission and are already sold. For inquiries on the price of a commission work contact me at Jonathan Maples or go to my Webstore and click on Kakejiku for different scroll prices. 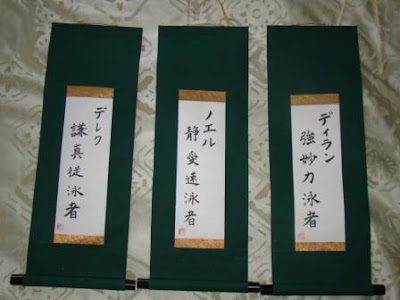 This customer requested two scrolls made for each of his child's names. 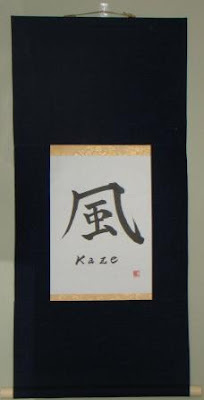 The word for rain is Ame and the word for wind is Kaze, which he also requested to be written in the Romanized form of Japanese below the character. I chose the green cloth for the rain because rain brings precious life to the plants making the world green around us. I chose the blue for the wind because at times the chill of the wind can make us feel blue. This work reminds me of a beautiful story about 宮本武蔵Miyamoto Musashi, who many martial arts experts consider the most deadly swordsman of all time. If you would like to order a custom scroll there are three ways to get started: 1. 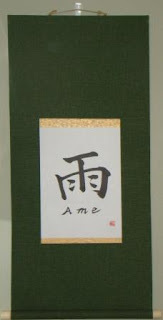 Go to my shopping site at www.shop.customjapanesecalligraphy.com 2. Download my scroll design workbook from my website at www.customjapanesecalligraphy.com to read about the concepts behind kakejiku or wallscroll design. 3. 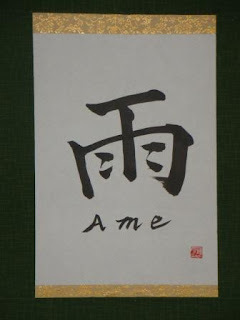 E-mail to me directly at sales@customjapanesecalligraphy.com During his life, a feud brewed between two Samurai. One was Sasaki Kojiro and the other was Miyamoto Musashi. An isolated island was decided upon as the place for a sword duel, between these two warriors. Sasaki was famous for his use of an extra-ordinarily long katana. It is said in legend that his training was completed after he learned to kill a swift swallow mid-flight by this sword. Musashi on the other hand gained his reputation by defeating the entire founding family of a fencing school, and when outnumbered would utilize a fighting style with two swords. 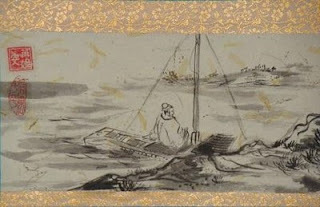 As the duel date approached, Musashi climbed in a boat seemingly unarmed. He rowed to the island and the people who had gathered to witness the duel were still amazed to find him unarmed. Every day Musashi would get up early and sit on the beach from different positions as the sun would rise. Finally still unarmed on the day of the battle Musashi arose early and positioned himself on the beach with only the oar in hand as his weapon. Sasaki, quite confident, thought he could easily dispatch this enemy. Musashi waited for several minutes and at an exact moment that only he knew, rushed for the attack. As Sasaki prepared his sword, the light of the sun flashed off the blade into his eyes, momentarily blinding him. Defenseless, Musashi struck Sasaki with one blow to the top of the head with the long oar and killed him. So why am I telling you this story, because when I saw this picture this story was the first thing to come to mind; Musashi meditating on the beach and planning in his mind the angle of the sun and the time of attack. I used this inspiration to think of clear sky on a beach, and used this sky patterned cloth to evoke the peaceful images and painstaking planning in which Musashi used to stake his life in a duel. So although, there is peace to the work, it forebodes a more terrible moment in history yet to come. You can read more about Musashi’s Martial Art philosophy and life by reading The Book of Five Rings. It has been translated several times by different individuals. In addition to being a great warrior, he was also a poet, calligrapher and artist. It has been so long since I have posted a scroll many think that I may not be making kakejiku anymore…These next few Sumie are the work of Ren Adams, a New Mexico Sumie artist. I like Ren’s work for the simplicity, yet complexity of the shading of her brush. This is a beautiful original rendition of the new growth of a bamboo branch. I appreciate her work and her talent. 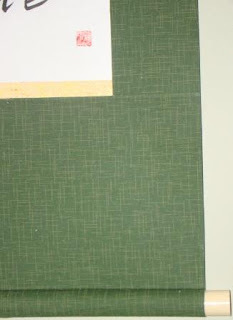 This scroll measures 12 inches long by 5 ¼ inches wide. 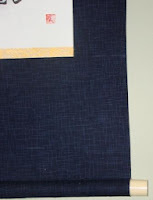 It is in a two-step style with a Navy Blue Ten and Chi and a Gold Chuumawashi. This scroll sells for $15.00 and $3.50 shipping in the US. For inquiries on other original works and scrolls contact Jonathan Maples. I have not written anything in a while, I am still busy with many scroll orders, I just have not completed them yet. But I wanted to write about the General Movement of the arts in the Hakuho period of Japan. Hakuho is listed as being between 650 and 710 A.D. It was during this time that the Tang Dynasty had reached it's peak in China. It was during this time in Japan that a significant importation of artists from Korea and China would have a great influence on the subsequent Japanese art. Also, likely due to the influence of Prince Shotoku in the previous Asuka period, a Government Internal Affairs Bureau was created. This helped to support and proliferate arts in this time period. As part of this Internal Affairs, there were 4 Master Court Artists appointed called Eshi and working beneath these masters there were 60 court painters called Edakumi. 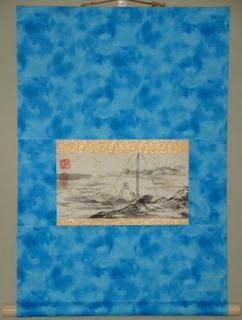 Having a professional artisan class is what will help drive the incorporation of hanging wall scrolls into the culture of Japan during the Kamakura period.